If you’re planning on taking advantage of the ski slopes this winter, there are some things that will help you to avoid an injury. 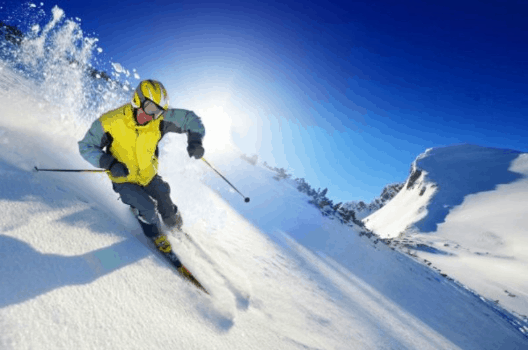 For most of us who only ski one or two weeks of the year a big week of skiing can be hard on your body and may lead to an injury. There are some things that you may want to consider before hitting the slopes. Getting your skiing apparatus adjusted will help you to perform better on the slopes, as well as avoiding an injury. This principle also applies to rented ski equipment. It’s important that your equipment is fitted by a professional and adjusted to your body and level of ability. Being honest about your ability is important as higher level equipment is often harder to control and gives you less room for error in an accident. Definitely do this whilst you’re still at the rental store choosing your equipment and don’t leave until you are sure that you are comfortable. Take your ski socks with you, and if you wear orthotics for your feet check to see if you can use them in your rental boots. You can’t always be sure until you hit the slopes so don’t be afraid to take the lift back to the store to get adjustments made. Half an hour out of your day is better than spending the week with an icepack on your knee. If skiing is your sport of choice, it’s important to make sure that your boots fit you firmly so that your foot is supported. You should feel that your foot doesn’t move around too much in your boot. In particular, your heel shouldn’t lift up the back of the boot and while you might feel the end of your toes against the tip of the boot, they shouldn’t feel squashed. It’s a good idea to get ski specific socks that fit snuggly and again make sure you get your fitting done whilst wearing your ski socks. While you’re at the ski shop, double check to make sure that your ski bindings have been tightened correctly to let you eject your skis if you fall over. The tightness depends on your level of skill, the higher your skill level the tighter you have the bindings set and beginners need a reduced tightness for safety. Again be honest about your skill level so that you can get the settings right. Ski accidents happen in all sorts of ways whether you fall onto firm snow or have a collision with another skiier. There is an extremely high rate of concussion in snow sport and 10% of concussions result in a loss of consciousness. Whatever your skill level accidents are never predictable and protecting your head and brain is super important. You need to wear a helmet that fits you properly and can adjust to remain snug on your head whilst you are skiing. If you wear a beanie to keep your head warm bring that with you when you get fitted for a helmet. Keep the chin strap snug so that the helmet stays on. Accidents even happen whilst you are waiting in a dreaded lift line, so wear a helmet at all times whilst you’re on the snow. Specific strengthening exercises to prepare to ski are crucial to make sure that your body can handle the physical stresses and stay in control all day long. Strengthening your lower limb muscles but also working on your core muscles and balance, will all be integral parts of any Ski specific program. Seeing a Physio who specialises in individualised exercise programs and understands the stresses of skiing is the way to go. Adjust the buckles on your boots, so that your foot becomes accustomed to the tight fit and you’re able to walk properly to the ski lift. Once you’ve jumped on the lift you can tighten them whilst you’re on the chair. This will prevent you from falling or stumbling over in the process. If your boots become uncomfortable whilst your skiing, get them adjusted or change them as foot pain can make it harder to ski well. Sharpen the edges of your skis, Aussie slopes can be icy and quite crowded, this means that you may need to stop quickly, make sure that your skis allow you to do so. Get your skis waxed if you feel like they are stuck in the snow. Whilst this makes them move better getting stuck in soft snow is often a recipe for disaster. If you need any extra tips as to how you can prevent skiing injuries, press here to make a booking at your nearest practice.